Barcelona may be strong favourites for their Champions League quarter-final against Manchester United, but their recent history in the competition is not the best. Humiliation against Roma in the quarter-finals a year ago was just the latest disappointment of recent years for the Catalan giants, who have not reached the final since defeating Juventus in 2015. A mini-drought would be of little concern to most clubs but Barca, with Lionel Messi leading their ranks, are not like most teams and European success is simply demanded at Camp Nou. United triumphed against the odds in the last round to knock out Paris Saint-Germain and Omnisport has picked out four Barca defeats in the Champions League that can give Ole Gunnar Solskjaer’s side hope. United’s rivals City showed how to beat Barca in the group stage in 2016. After all, who better would know the way to face Barca than their former coach, Pep Guardiola? Ilkay Gundogan scored a double while Kevin De Bruyne struck a wonderful free-kick to earn City a memorable 3-1 victory. They had to come from behind to do it, though, after Neymar set up Messi for the opening goal in the first half at the Etihad Stadium. City took a step towards qualification with a huge win sparked by Sergi Roberto’s mistake in the build-up to the equalising goal. City had been taken apart 4-0 at Camp Nou but Barca could not live with the speed at which Guardiola’s side moved the ball with Raheem Sterling, Sergio Aguero and De Bruyne all virtually unstoppable on the night. Use of direct long passes by City caught Barca by surprise and with the pace of Marcus Rashford a major threat on the break, this could be a route to success for United over this month’s two-legged clash. Later the same season, Barca slumped to a shocking 4-0 thrashing at the hands of Ligue 1 side PSG, for whom former Real Madrid winger Angel Di Maria scored a brace. Julian Draxler and Edinson Cavani were also on target in a game that saw minimal impact from Messi. Barca were sloppy in possession throughout this defeat and even Messi was guilty of giving the ball away on too many occasions, but credit has to go to PSG for the way they punished those errors with clinical attacking and a cutting edge in front of goal. 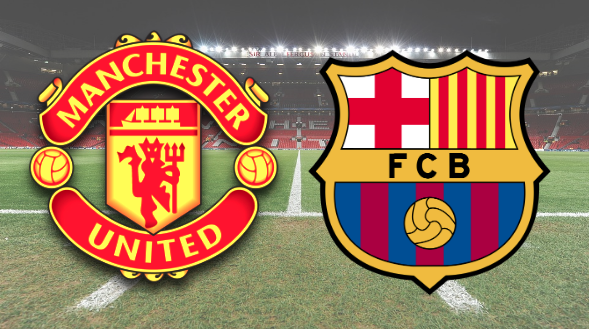 Gerard Pique was badly exposed during this game and United may see the defender as a weakness they can exploit during the quarter-final, former Spain international having endured an uneven campaign despite Ernesto Valverde’s side being on track for a possible treble. Just two months later and Barcelona were caught out again in a first leg away from home, with Juve this time dishing out the punishment in claiming a 3-0 advantage. Paulo Dybala’s brilliant first-half double seemed to have established the Argentina ace as a future heir to Messi. Luis Enrique, having confirmed he would leave Barca at the end of the season, used the same 3-4-3 formation that helped knock PSG out with a stunning display of attacking football, but they were stifled by Massimiliano Allegri’s more streetwise defenders. Surprise starter Jeremy Mathieu was beaten in the build-up to Dybala’s opener and Juve did not look back, with even Barca’s change back to a more familiar 4-3-3 formation unable to turn the tie around in their favour. Barca could find neither the space nor rhythm they are accustomed too and a similar approach from United, getting in the faces of the Catalan side, could be fruitful. One of the great comebacks in Champions League history, few gave Roma any hope of overturning a 4-1 defeat at Camp Nou in the second leg of last season’s quarter-final. But Barca were bizarrely flat at the Stadio Olimpico and struggled to cope with the intensity produced by Roma. An early goal from Edin Dzeko allowed the Roma fans to dream and when captain Daniele De Rossi converted a penalty, the comeback was suddenly on. Kostas Manolas sparked mayhem with a late header to draw the tie level at 4-4 on aggregate, sending Roma through on away goals. Roma set an incredible tempo throughout that Barca were simply unable to match and although Eusebio Di Francesco’s side fell short against Liverpool in the semi-finals, Roma will remember this victory forever. Solskjaer and United can take note of the way Barca crumbled under pressure even when in a dominant position, so they should not worry even if they fall behind in the tie.